This week, from Monday, January 28 to Friday, February 1, features Astronomy on Tap, LA Magazine’s Best Restaurants, a Taco Deathmatch, freebies at Alfred Coffee, Photo LA, Pop-Up Magazine, and MUCH more. 1. Astronomy on Tap hosted by Caltech Astronomy happens once a month at Der Wolf in Pasadena. Professionals will give informal talks about a variety of topics while enjoying German beers with the public. 3. Dine on specially priced lunch and dinner menus at one of SGV’s best dining destinations through Taste of Alhambra Restaurant happening January 27 through February 2. 4. The 18th Annual 50 Hour Drive-by Theatre Festival is a three day fest (January 26-28) of new plays performed at LA’s most interesting NOHO theatre, Zombie Joe’s Underground. 5. Head to Burton Chace Park for a donation based morning yoga session under the pergolas by the marina. Your own mat is required. 6. Looking for some physical exercise on a Monday night? Check out the Hollywood Dodgeball Open Gym Night hosted by World Dodgeball Association. Free for newbies! 7. Los Angeles Magazine’s 6th Annual Best New Restaurants Celebration 2019 returns on January 29 for a celebration that honors the city’s most appetizing openings. 8. Alfred Coffee Melrose Place celebrates their sixth year anniversary with special surprises and freebies all day long. 9. Bottle Logic from Anaheim will stop by Tony Darts Away in Burbank bringing with them some of their signature brews. 10. There’s a Downton Abbey Trivia Night happening at Hamburger Mary’s in West Hollywood this Tuesday. 11. There’s a Men’s Yoga session happening in West Hollywood that specifically targets common areas of tension on the male body like shoulders, hips and hamstrings. 12. Pop-Up Magazine’s 2019 Winter Show comes to the Theatre at the Ace Hotel on January 30 to celebrate its latest issue. 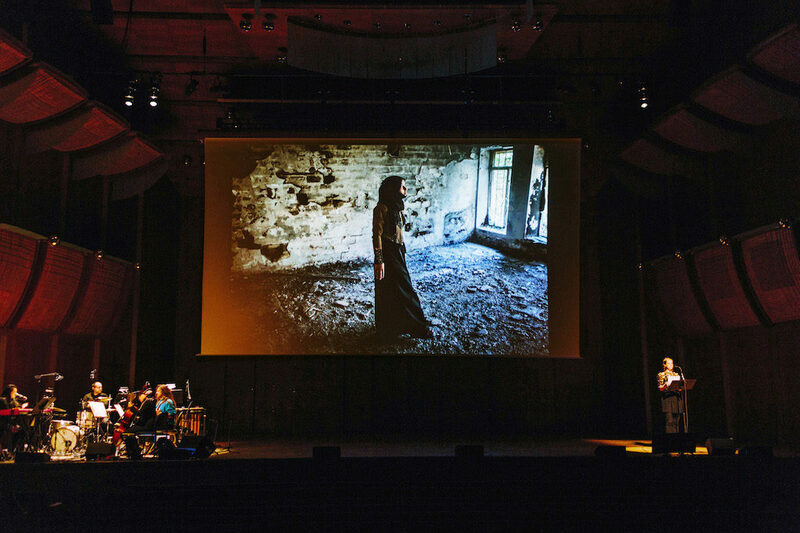 Known for being a live-magazine, pieces are created for stage and screen, and are performed in-front of a live-audience. 13. Starting on Wednesday, Angelenos can karaoke their hearts out in the comfort of their very own Sanrio-themed rooms that include private spaces dedicated to Gudetama, Aggretsuko, and Hello Kitty at Energy Karaoke located in Alhambra. 14. The Continental Club hosts cocktail classes every Wednesday where you can learn bar basics, techniques and a little history on classic and contemporary cocktails. The class will be followed by a spirits tasting. 15. Come to the Frogtown Brewery this Wednesday for trivia night hosted by Geeks Who Drink. 16. Brooklyn Brewery stops by Beelman’s Pub for Bar Talk: Craft Beer, Innovation & The Great Cape Debate. Both Founder Steve Hindy and Brewmaster Garrett Oliver of Brooklyn Brewery will be there to discuss the latest pressing brew questions. The discussion is free to attend and they’ll be pouring a few favorites. 17. Burrito Project L.A. is looking for volunteers to help make burritos and distribute them to the hungry this Wednesday. 20. Drive River Brewing hosts a Taco Deathmatch taco eating competition where contestants will attempt to eat five super spicy tacos each hotter than the next as fast as they can. Entry fee is $5 and for those who just want watch they’ll be serving some $5 brews throughout the event. 22. There’s a Food For Thought Open Mic Night happening at Angel City Brewery where people can share their art, poetry, spoken word, stories, laughter, dance and wisdom. Free to attend, sign ups start at 8 p.m.
23. The Food Truck Collective happens every Thursday from 5:30-8:30 p.m. on Magnolia Blvd. Food trucks will line the street and live music will be played during. 26. Severance Wine Bar wants to celebrate your single status during their BREAKUP BAR POPUP. Taking place next door to the bar, the two week long party will transport guest into an anti-Valentine’s Day world with break up appropriate movie screenings, a Wall of Broken Relationships, loads of champagne, cocktails and food. 27. Never been to LACMA? First-time Fridays is a new monthly event for new visitors to the museum. Simply let the ticket office know you’re a newbie and you’ll receive a free poster, discounts and a welcome gift. Stop by after 3 pm with a L.A. County residents ID and get free admission. 29. Rare Books L.A. comes to the Pasadena Convention Center February 1 – 2 to help book lovers discover literary treasures from all over the world. The fair will feature one hundred of the finest specialists in antiquarian books, fine prints, photography, and ephemera from throughout the United States, Europe, and Asia. 32. It’s First Fridays at The Village in Redondo Beach. Merchants and art galleries will stay open till 8 p.m. and a live performance by Mr. Loop next to the Aloha Bungalow. 33. Greenbar Distillery will open up their facility for a tour of their organic distillery. The tour allows guests to learn about the process of spirit making and taste some of Greenbar Distillery’s portfolio. Happening every Friday through Sunday of this month. 35. Since its the first Friday of the month check out all the cool events happening around town including block parties and art walks for First Fridays. 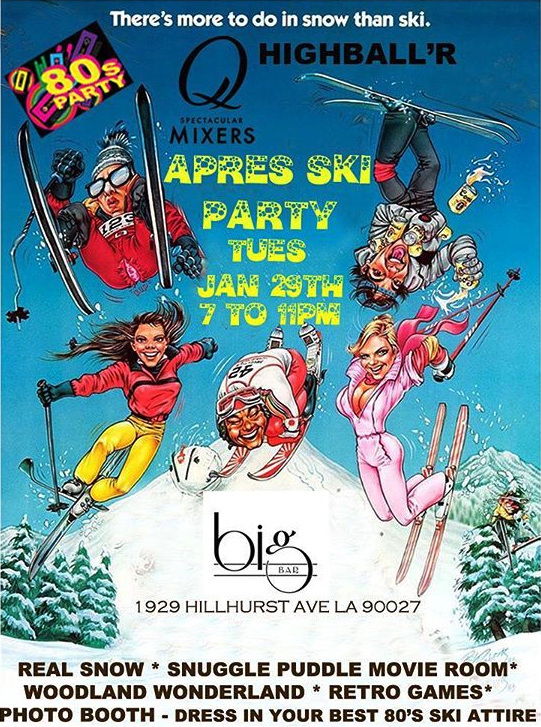 This Tuesday Big Bar in Los Feliz collaborates with Brooklyn’s carbonated mixer Q for an epic Après ski-themed party titled HIGHBALL’R. Here’s the setup: Picture an insane “winter wonderland” with actual falling snow (five tons to be exact) and all the things that come with “after skiing” traditions like a fire pit, gourmet s’mores and boozy hot chocolate. Five of the cities best bartenders will be serving highball cocktails behind the bar including Cari Hah (BigBar), Clare Ward (Hippo), Jesse Smyth (Genever), Ash Miyasaki (Bar Henry), Scott Eaton (Melrose Umbrella Co.), and Nick O’Connor (Apotheke). Grab a highball and your s’mores then head to the Snuggle Puddle Lodge, where you’ll unwind to 80s fantasy movie favorites like Labyrinth and The Princess Bride. All guests are encouraged to come dressed in their best 80s ski gear, or at the least wearing gloves to partake in a snowman competition. Festivities take place from 7 to 11 p.m.